Our own real-world Stephen Colbert skit is playing out before our eyes. Security Regulators are up in arms about the prospect that the average American can decide if he or she is smart enough to invest $10, $100, $1,000 or $10,000 into an entrepreneur they know, via would be SEC-registered websites, that would allow entrepreneurs (who had cleared background and security checks) to raise money from their friends and family. Hence they are spending millions of dollars on lobbyists and staffing Senate hearings with opponents to derail Republican–led legislation that the House of Representatives passed with 96% approval. (Yes this is the same House that rarely passes things with such bi-partisan approval). This was also endorsed by a Statement of Administrative Policy by our Democrat President –all of which is meant to help keep America competitive, spur innovation, encourage entrepreneurship and create millions of jobs. There are two bills before the Senate. Senator Reid must act to bring a Crowdfunding Bill much like the House version to the floor to vote on. Entrepreneurs, The US House and The President get it. Jobs won’t come if we don’t provide the capital. Let’s not look to past to get us out of this problem. Let’s look to the future and the success of Crowdfunding globally. If 96% of the House thought it was worthwhile, shouldn’t we expect the same from the Senate? Are we really going to let Special Interests that care more about their own power than our future economic prosperity kill crowdfunding legislation in the Senate? An inside-Beltway battle is being fought between the people trying to propel our country forward, America’s job creators, and those holding us back, Regulatory agencies including groups like the North American Securities Administrators Association ( www.nasaa.org ).. They are more concerned with clinging to outdated laws written 78 years ago than the economic needs of our country. Current regulations, were written before most homes had radios, much less the Internet. This was during a time when your “social network” was a stack of business cards that you could write letters to send via the US Post Office. Now, this deeply entrenched bureaucracy prevents entrepreneurs from using the Internet and social media to go to their friends and family for investments. The U.K. has just updated their security laws to allow their citizens to finance their nation’s job creators much in line with what ProFounder was trying to do. What the UK realizes, is with the advances in technology and the Internet, there is power to a group of interconnected people vetting an entrepreneur in an open and transparent platform where they can decide if she or he is worthy of funding. As of last week, it was going so well that the UK Government began to offer tax credits to their citizens to encourage investment. The financial markets in the US for entrepreneurs and small businesses are STILL FROZEN. With all the talk about it, the reality for most small businesses is they have no access to working capital. Access to capital is the number on concern according to a recent study by the Small Business & Entrepreneurship Council. Allowing Main Street to step in and fill the void left by Wall Street, the banks and Venture Capital can only help propel our country forward. We need to stand together. We need to legalize Crowdfunding. If you are an entrepreneur register at LegalizeCrowdfunding.org now! Sherwood Neiss and Jason Best are Co-Founders for the Startup Exemption, which brought the idea for “Crowdfund Investing” to Washington a year ago. They have recently launched LegalizeCrowdfunding.org to quantify the impact the legalizing crowdfunding can have on our nation. Join a group of your colleagues in Canada and the U.S. on Tuesday, March 6th beginning at 11:00 am EST for an important Teleforum Conference Call on the future of seed and growth financing for start-ups and entrepreneurs. The briefing team will be lead by the founder of the Crowd funding movement, Sherwood Neiss, Chief Advocate for The Startup Exemption. Mr. Neiss will describe the advances in technology, the Internet and Social Media to allow an entrepreneur to raise a limited amount of capital from his friends, family & community under a framework that provides for investor protection. Also attending the call to provide background and guidance will be members of the CATA Crowd funding Action Committee (see below), including, Tom Houston, Partner, FMC Law, Andrea Johnson, Partner, FMC Law, Peter Andrews, Regional Director, Corum Group, Steven Hurwitz, Partner, Choate, Hall & Stewart LLP, John Reid, CATA, CEO, Gary Stairs, CEO, Chair and CEO of Stellar RHL., Michael Turner, VP, Wesley Clover, Jordan Smith, B.Sc., Senior Manager, Deloitte and Paul Dombowsky, CEO, Ideavibes. Crowd funding is local vesting and community vetting where only the winning ideas receive not only funding but shared knowledge, experience and marketing power. Crowd funding makes it easier for business to obtain investment by selling stock to small investors. A new Bill is currently in the U.S. Senate to exempt crowd funding from State regulation of securities offerings. CATA has launched an advocacy Campaign to encourage Canadian legislators to adopt approaches similar to the U.S. approach. “We don’t want to have this launched in the U.S. and then have to play catch up,” said CATA president John Reid. CATA is lobbying provincial securities regulators to make similar changes here. While the new American legislation would be overseen by a single national watchdog, the U.S. Securities and Exchange Commission, Canada still has no national regulator, after a Supreme Court decision recently declared such a body unconstitutional. “I believe the Canadian government is very behind in this and should be pushed harder because access to capital is a big issue. Making it easier for start-ups to get that money is important,” said Johnson. ++ Action Items: How do I sign up? Please note that spots on this call are limited. Your local call in number and access code will be sent to you via email. Callers have local dial in numbers in all major Canadian and U.S. cities and free access worldwide using Skype. The Kauffman Foundation for Entrepreneurship hit the nail on the head. “Startups aren’t everything when it comes to job growth. They’re the only thing.” Other than a good idea, the most critical thing to launching job-producing businesses is capital. Historically, capital to fund the nation’s job creators came from Angels, Private Equity and Venture Capital. But a new downward financing trend is emerging and the results are potentially devastating. While there was an overall decline in funding across software, Internet and IT services, by far the largest drop was in seed funding for startups, which almost halved in 2011. As traditional VC firms have moved into later stage funding, Angels and Private Equity have moved into the space they once occupied. The result is a larger void at the Seed Capital stage. Without capital to fund startups, the outlook for the nation’s entrepreneurs is grim. Back to the Kauffman study. A major finding is that start-up firms (those younger than one year old) create an average of 3 million jobs annually, while existing firms lose 1 million jobs each year. This is predicated upon capital available. 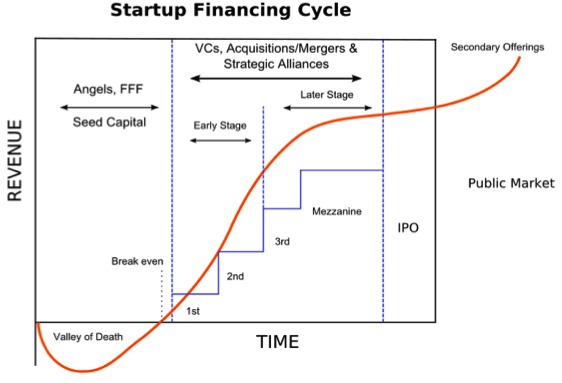 If Congress legalizes Crowdfund Investing, with the departure of VCs from the startup space, the future of seed and expansion capital stands to look like the chart to the right. With countries like UK leading the pack, it is just a matter of time before the US follows suit. That or we risk seeing our economy decline as entrepreneurship and innovate fall victim to the Valley of Death. 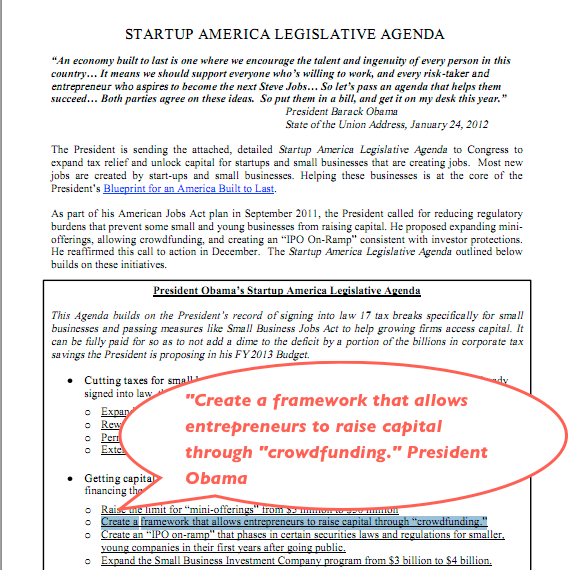 In a press release issued by the White House today to celebrate the 1-year anniversary of Startup America, President Obama again called on Congress to pass a Crowdfunding Bill that would allow entrepreneurs to Crowdfund Investments to launch new businesses and create jobs. The announcement comes after the State of the Union Address in which President Obama made reference to easing the regulatory burdens on startups, small businesses and entrepreneurs. The current regulatory system requires that entrepreneurs seeking to raise capital go through lengthy and costly procedures. These procedures are necessary for businesses that are raising larger, more traditional means of financing but for ideas coming from college business plan competitions or Startup Weekend Challenges they are a deterrent. Since small businesses are our nation’s net job creators, we need to do everything in our power to get them the capital they need so that they can innovate and hire. 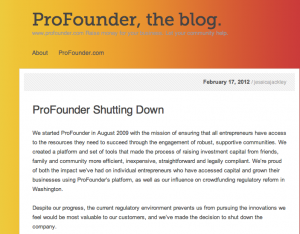 Crowdfund Investing is a zero-cost solution to the jobs crisis. It doesn’t require government spending but easing of regulations that were written over 80 years ago. These regulations while good in there intent are holding back the creative force of America’s entrepreneur. Only with the advances in the Internet and Technology can easing regulations allow the crowd to step in where Wall Street and the Banks have left off. Obama Pressures Congress for Crowdfund Investing! Crowdfund Investing is the zero-cost government initiative he is discussing that can create millions of jobs! The President gets it. The House of Representatives gets it! Now we have 2 bills in the Senate. Let’s get this on the desk of the President NOW so that we can get back to innovating and creating jobs! On Tuesday January 24, 2012 President Obama delivered the State of the Union Address. He highlighted the challenges our economy faces and the direction in which we need to take the country. One of our nation’s biggest challenges he focused on is unemployment. Crowdfund Investing (CFI) also known as equity-based crowdfunding, is a solution to the jobs crisis. We originally pitched this idea to Washington a year ago. CFI allows the community to fund their local entrepreneurs to spur innovation, launch businesses and create jobs. And it is one of the solutions the President supports. Our framework is the basis for all the bills before Congress (HR.2930, S.1791 & S.1970). And until we legalize it, we can’t help fund our nation’s net new job creators. Politicians use crowdfunding daily. It is how they fund their campaigns. They go out to thousands of supporters and say, “Hey give me as much money as you can afford (capped, of course). Collectively it will add up to something substantive so that I can talk about my goals, build my team, market my message and get elected (or re-elected).” Entrepreneurs do the same thing (take an idea, make a proof of concept, build a company, and hire employees to market and grow) but only with accredited investors. Here’s the ironic part. It is legal for politicians to go to the masses but illegal for entrepreneurs to do the same thing. When it comes to crowdfunding, entrepreneurs are held to a different standard than politicians. Yet politicians constantly look to them as the solution to our economic woes. Why are there rules on how much money one has to make in order to give to an entrepreneur but there are none when it comes to politicians? Do you know that 100% of Americans can give to politicians of their choice but only 5% of Americans can invest in entrepreneurs that can create jobs? In full disclosure, the rationale (according to the opponents to Crowdfund Investing) is that Americans aren’t sophisticated enough to understand the risks inherent in investing in startups. They don’t understand that there are bad actors in the marketplace. They are gullible and believe the first thing anyone says. If they don’t think people are sophisticated enough to decide how to invest a few thousand dollars in a venture, why do they think they are smart enough to choose the right candidates? Why do we allow people the freedom to use their money as they wish when it comes to crowdfunding politicians but we don’t give them the same freedom to use their money as they wish when it comes to investing in startups and entrepreneurs? Are we to assume that there’s no fraud in politics? Should the supporters of Representative Weiner or Presidential Candidate Herman Cain get refunds? This election season half a billion dollars will go to fund the campaigns of many a politician. Imagine the impact we could have on our economy if those same dollars went into starting new business ventures? Businesses create jobs; jobs provide income, which consumers spend in order to live. Increased consumer spending stimulates the economy. This will get us out of the recession. Our conclusion is simple. If people are deemed smart enough to invest in the right politician, shouldn’t they be able to do the same, freely, in a business? The time is now to change the security laws that were written 80 years ago. The Internet can allow us to identify those ideas we deem worthy and fund them with the same dollars we spend on political campaigns. Crowdfund Investing is the mechanism to allow it all to happen. 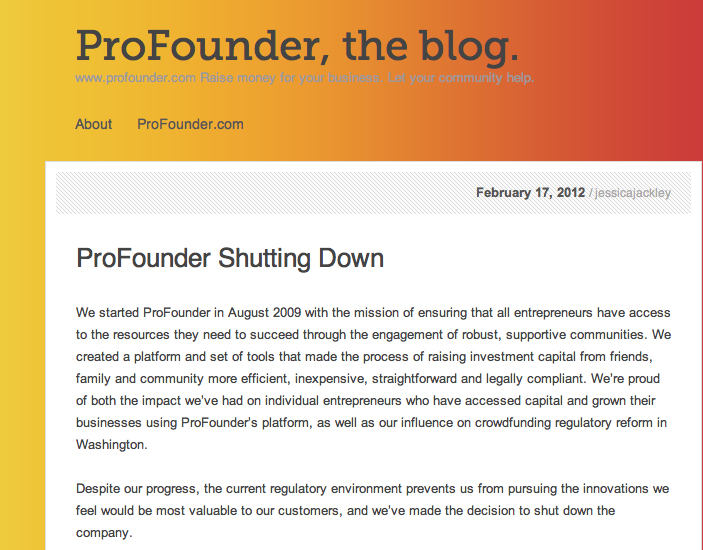 Join our cause to make Crowdfund Investing legal in 2012! Ps – Our statisticians performed some analysis on entrepreneurship based on data from the Census, the SBA and the Kauffman Institute. If we legalize Crowdfund Investing over the next 5 years we can launch over 500,000 jobs that have the potential to create 1.5M jobs! When discussing the current crowdfunding taking place, the question is raised: “why are people doing this?” If only 43% of projects on Kickstarter succeed, why aren’t people crying foul but instead pledging more than ever before? ($9M in December, 2011 on Kickstarter compared to $4m in January, 2011). The answer is simple. They want to help someone they know. They want to support an idea. They want to be part of a community and they want some recognition for it. People are drawn to crowdfunding because they are capitalists. They admire entrepreneurs, and they know that sooner or later they may be entrepreneurs as well. What are they basing it on? It comes down to trust and transparency. AirBnB is one of the nation’s fastest growing crowd sourcing startups focuses on renting other people’s floors, rooms, homes, yachts – even igloos. It is growing at a staggering 45% per year because people trust the system, vet the offerings and rate them as well. On the Internet, when your “wares are out there,” it is on the line for everyone to see. By being transparent, you build trust. Users check out the reviews, read what other people are writing and make careful and informed decisions. All of this is recorded and becomes part of a larger “self-­policing community” of profiles for both parties and a greater community rating system. These reputations today are carrying across the web from eBay to Tripadvisor to Rate-­a‐VC. Other companies like TrustCloud aim to become a portable reputation system where their algorithm collects your online “data exhaust” – the trail you leave as you engage with others on Facebook, LinkedIn, Twitter, commentary-­‐filled sites like TripAdvisor and beyond – and calculate your reliability, consistency and responsiveness. The result is a contextual badge you carry to any website, a trust rating similar to the credit rating you have in the offline world. These are tools that can and will be incorporated into any online crowdfunding platform to help foster transparency and accountability. So let’s address all the naysayers. What if we carve out an exemption and it all comes tumbling down? What if we open the doors to defrauding thousands of people out of $80? Are these protectionists right? Will crowdfunding bring down the entire economy? To them we say, recall what happened in the Ireland Banking crisis of the late 70’s when the bankers went on strike and warned the public that the economy would collapse without a banking system. What happened instead was a peer-­to-­peer banking system where the local pubs became de facto banks, lending money to their customers. It worked so well that some people even joked that there is no better judge of character than a bartender. Opening the doors to a limited exemption will not cause the fraud that Worldcom and Enron did to their employees and investors, or that Wall Street and Bernie Madoff perpetrated on the American people. It will create a peer-to-­peer system where communities become the de facto seed and early stage funders to entrepreneurs. And if you think about it, there is no better judge of character in the United States than your neighbor, friends, and family. But there are more reasons to trust the crowd. First, they are massively diverse. Fundamentally the collective IQ of the crowd works like this. Every time a new member joins who has one or more superior facets of IQ, the collective IQ is raised by those unique facets. Second, the values that VC’s claim to provide will be disrupted by the crowd. A VC’s Rolodex is easily replaced by social networks (i.e. : LinkedIn). And the Rolodex of a few thousand crowd investors is much stronger than that of a few VCs. Third, expertise – it is disputable that the people who manage money bring more operational experience to the table than an interconnected crowd of people, many of whom are investing in you because they understand your business. And finally, valuation sophistication – the crowd has been putting their value on things since the beginning of time. Price anything too high and no one will buy it. These naysayers act as if crowdfund investing were made legal, then every American will dump their savings into this. So either that makes us think they REALLY think we have the solution to kick starting our economy and are afraid of money not being invested traditionally OR they think that everyone for some reason will see crowdfund investing as lower risk than any other choice they make in their daily lives when in fact we all know this isn’t true. Crowdfund investing is more than just money – it is facilitation, diligence, team building, and valuation. Most importantly, it is jobs. That being said, we shouldn’t assume that “everyone” will bring expertise. Some will be a marketing engine for the entrepreneur and others will just bring a few dollars. Collectively, they will gather behind entrepreneurs they believe in, they will fund only those they are willing to risk their investment in and they will invest only if they think what they are being offered is fair. Trying to circumvent the crowd to bilk them out of a lot of little dollars isn’t going to be worth the time or energy of a shyster. There seems to be a general understanding in Washington that government spending stimulates the economy, but that when it comes to letting the average American decide how he or she wants to spend and/or invest his or her own money, then we need government oversight. In doing so, Entrepreneurs will learn how to communicate, be accountable and transparent, and investors will provide critical seed and early stage capital. Jobs will be created, innovation will be spurred and our economy will continue to grow. If the dollar amount isn’t what concerns you but the potential for fraud, even at $1, then we need to have a frank discussion about that. As Kevin Lawton, author of The Crowdfunding Revolution says, “Fraud isn’t really the issue, ‘Failure’ occurs much more frequently in startups.” According to a Kauffman Foundation survey, approximately half the time you will lose all or some of your investment. Just as you diversify in the publics markets to reduce exposure, having a portfolio of varied investments solves failure in the crowd funding space. As we have seen from over $500 million donated to projects and ideas through crowdfunding already, while people are concerned about losing their money, they are more interested in helping someone bridge the gap, bring an idea to fruition, succeed, and in the end being able to tell their friends and family they had a part in the creative and entrepreneurial essence of what it is to be American. It’s like paying for a brick in a new park or baseball stadium to be engraved with your name. And thus, the biggest problem we need to solve is education. Running a portfolio and understanding the risk-­vs.-­reward dynamics of investing in early phase companies is essentially an education problem. One way to solve the problem of unaccredited investors making investments, if you think of it as a “problem,” could be to make people ‘educationally accredited’. This can be done with a simple document, which explains the basics of the risk-­vs.-­reward curve of risk startups and the basic principles of a portfolio. It can be done in a few pages and can be sent out in paper form, transmitted via email as a pdf, or done online in a more scalable way via a platform. Before being allowed to invest, people would have to answer a series of questions that test their comprehension of the document. Instead of pushing people down with a relentless assault on their intelligence, perhaps we should contemplate that people are adults and will make their own decisions. Our job should be to educate: education helps to create prosperity. Education will teach the participants about analyzing and understanding risk. Nearly every company has a level of opacity. Even a brick-­and-­mortar restaurant business probably doesn’t give you their recipes. Tech startups don’t give you their ‘IP’, often not even to VCs. That’s how it is. Lack of complete transparency creates a level of risk, which is why we have varied portfolios. And within an open market, if an investor has access to two similar deals, one of which is more transparent, which do you think he’ll invest in? Concerns should be focused on the basics of investing, such as disclosures of the principal people in the company, details of the business model, use of funds and the securities offered. There are two sides to every story. The same can be said for those who support and those who are against Crowdfunding. The proponents tend to be entrepreneurs, innovators, and America’s jobs engine. They are the ones advocating in favor of allowing entrepreneurs to raise a limited amount of capital from their friends, family & community. They are a fragmented group by nature, heads in the sand, focused on their businesses without deep pockets or the backing of special interests. The major opponents to crowdfunding are the SEC, FINRA and NASAA. They are government bureaucratic agencies with a vested interest in the current system, widespread oversight and deep pockets. Their job is to protect and regulate the large, often complex, public markets. However they tend to do so at the expense of small businesses. Overly bureaucratic rules, we see time and again, have a trickle-down effect on small businesses that hamper growth. 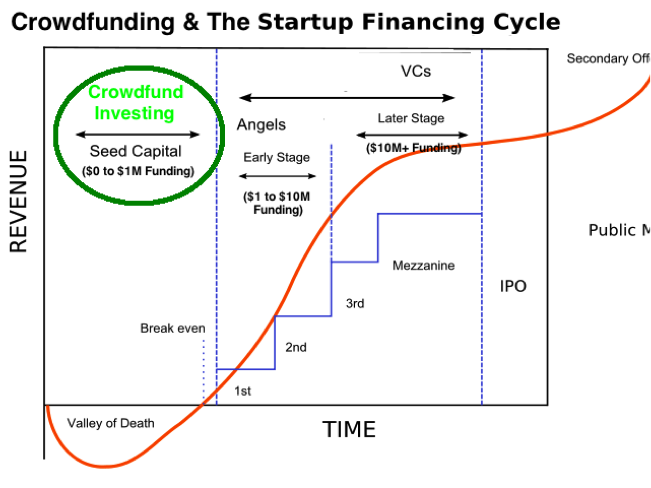 The following chart summarizes the arguments for and against Crowdfund Investing. 1) CFI will undermine important investor protections and prevent State Securities Regulators from enforcing meaningful parts of state investor protection laws. 1) CFI provides the same enforcement at the community level with hundreds of people, that the highly bureaucratic and costly process of only a few eyes does at the state level. Both State Regulators and users of CFI will actively be regulating the CFI industry: making sure the entrepreneur is real and making sure the investment opportunity is sound. Unless hundreds of people agree together no business will be able to raise their funding round. In addition, CFI users will provide something that State regulators can’t: the ability to decide pre-funding if an idea is worthy through an open dialog between and among the investors and the entrepreneur. Regulators can determine if enough information is disclosed but they cannot control the conversation that will either foster or deter investments. This conversation among the participants is the key element of investor protection that will be handled better by the participants, who have a vested interest in finding the truth, rather than the State Security Regulators. 2) Provisions of the Crowdfunding Bills would preempt the states’ authority to review offerings of “crowdfunded” securities 2) Current State-based regulations do not fit into the way business is done in the internet age. The SEC will have strong regulatory power over all Crowdfund Investing Websites and only SEC-regulated sites will be able to conduct CFI. This will limit who can crowdfund and provide a filter of crowdfunded securities. If startups and small businesses are forced to file with all states, they would spend all of their time and the majority of the funds they raised in filing fees and regulatory process. Streamlining the process with SEC oversight, while preserving the enforcement powers of states to pursue bad actors is what CFI proposes. This will lead to more organization and structure for those companies that go on to larger, more traditional rounds of financing that require state review. 3) It is crucial that the states retain full authority to review securities offerings in this area, given the significant fraud in this segment of the market. 3) Before any entrepreneur can use any CFI platform they will have to submit to a fraud/background check. No other form of current capital raising makes this mandatory. Unless an entrepreneur’s fraud/background check comes out clean (we also advocate for having a minimum credit score), he won’t be able to raise capital on CFI platforms. The opponent’s argument misses the transparency and speed that the social Web provides in investor protection. If you are confused about transparency think of all the data we emit on the internet on a daily basis. Any false moves can and will be uncovered and disclosed. For easy examples think of what happened with Representative Weiner and actor Alec Baldwin – their actions were immediately discussed on the internet: this is the nature and power of Social Media. Our framework also proposes a “one-touch” filing mechanism so that states can receive a “unified dataset” on a regular basis. This is the same data that they would seek in their review, and much of the same data found on a SCOR filing form. State Regulators fighting to be the ones to control this process will only make the process longer, more bureaucratic, and end up costing more for the same effect. 4) Protections provided by state review are even more essential because companies offering exempt securities under the Crowdfunding Bills will not issue ongoing reports like true public reporting companies. 4) We agree, there is nothing more transparent than communication. The reporting and communication that takes place for public companies is required because of the complexity of their organizations and broad spectrum on their investors. Public companies need to file public reports so investors can see what they are doing. (Albeit we’d love to see a report of how many investors are reading a corporate’s 10k’s). Because CFI is based on community financing, the social interactivity between the entrepreneur and investors will provide the communication and transparency about what is happening with the company and money invested. All this information will take place on CFI platforms, which will be open to the community investors as well. Again, a degree of transparency much more acute than that of public companies. Because of the open nature of the SEC regulated CFI platforms that we are proposing, when one investor has a question, all investors will be able to see the question and the answer. Today, if an investor has a question about a public company chances are it will go unanswered or only addressed at an annual meeting. CFI will provide immediate and continual reporting. 5) Further, as crowdfunding centers on community investment, the oversight should be vested in the regulator with the most direct interest in protecting that community. 5) Agreed, regulators need to provide the oversight for complex organization for which there is no other advocate for the investor. In CFI platforms those most directly connected to the community are the entrepreneur and those investing in them. The difference is now the community has a ‘role’ to play in Crowdfund Investing. And that role is oversight. Today more than ever, people aren’t haphazardly throwing money away. They have seen too much fraud taken place in the “regulated” markets to make them overly optimistic and confident about what someone says they are going to do, nonetheless someone they aren’t directly related. The oversight is going to be better regulated by individuals that know the entrepreneur and expect him or her to live up to what they say than a 3rd party regulator who is not related to the entrepreneur at all. Community banks tend to have lower default rates because of the relationship between the banker and the lendee. The same will be said for crowdfunding. 6) Strongly oppose provisions of the Crowdfunding Bills that would expand the registration exemption under Rule 506 of Regulation D by requiring the U.S. Securities and Exchange Commission to remove the long-standing prohibition against the general solicitation of these offerings 6) Prohibiting general solicitation had a time and place prior to the advent of the Internet and advances in Technology. Before these advances it was easier for one-to-one fraud (the majority of fraud) to take place. By restricting the communication channel down to two people it is easier to take advantage of unsuspecting individuals. By opening up the field of communication to regulated CFI platforms where general solicitation can only take place we still maintain how people are solicited and restrict it to these platforms. Controlling who and how general solicitation takes place this way will provide the investor protection that the ban on general solicitation was put in place to protect. According to Wikipedia, The Pareto principle also known as the 80-20 rule states that, for many events, roughly 80% of the effects come from 20% of the causes. The validity of the 80-20 rule can be seen throughout the economy. Why is the 80-20 rule important to consider in relation to the Crowdfunding bills that are moving through congress? Because where Congress sets the Crowdfund Investing limits, will determine if this legislation will create or destroy jobs and innovation. The Startup Exemption framework originally suggested $10,000 or 10% of an investors Adjusted Gross Income (AGI). Our rationale for the $10,000/10% AGI was to cap the maximum an individual could invest based on their income but also cap the total amount anyone could put into one endeavor at $10,000. This was to provide significant investor protection for unaccredited investors who choose to invest in this high-risk asset class yet allow higher net worth individuals for flexibility to use their cash as they see fit. The current bills before Congress each limit the maximum amount an investor can risk at different levels. The $10,000/10% AGI we advocate matches what is in HR2930. The Senate bills take different and more dramatically smaller positions; between $500 & $1,000. If these lower caps from the Senate bills are enacted, it will kill the value of this legislation and will dramatically limit or eliminate the possibility of any new jobs or innovation being created via Crowdfund Investing. Applying the 80-20 rule to crowdfunding, the theory would assume that 80% of the crowd will provide the majority of the count of contributions but the 20% of the crowd will provide 80% of the dollar value of the financing. If this theory is true, then it is crucial that the 20% of the investors that will provide 80% of the investment dollars are able to provide larger dollar investments. To prove this, we reached out to several of the major crowdfunding platforms and asked them for statistics on a few of their larger projects. We specifically asked for the larger projects because we anticipate the average amount entrepreneurs will seek in their initial rounds will be $50,000. Here’s what the data showed. From a group of projects that raised collectively $280,800, individuals who invested less than $1,000 accounted for 81.2% of the total number of investors. The remaining 18.8% of investors, who invested greater than $1,000, accounted for 93.8% of the total financing! Indiegogo, one of the largest donation-based crowdfunding platforms which has been around longer was able to pull data from a much larger data set. (They have funded over 25,000 projects). The data indicated the more money one raises, the more reliant on $500+ contributions one is. For campaigns that raised between $500 – $5,000, 24% of funding came from $500+ contributions. For campaigns that raised over $5,000, 46% of total funding came from $500+ contributions. For campaigns that raised over $10,000, 50% of total funding came from $500+ contributions. For campaigns that raised over $20,000, 53% of total funding came from $500+ contributions. 24% of the total number of investors contributed less than $1K. These individuals delivered just 4% of all funding raised. 76% of individuals who invested greater than $1,000 delivered 96% of all funds raised. The average investment was a little over $1,700/ investor. These statistics closely match what Crowdcube discovered. The data demonstrates how important it is to allow investors the opportunity to make investment decisions at a level that is appropriate to their income/net worth, while capping the total investment level for all unaccredited investors. $10,000 or 10% of AGI (whichever is smaller) should be that limit. The larger contributions are critically important to successfully funding companies. If overly restrictive limits of $500, $1,000 or even $5,000 are enacted it would have a grossly negative impact in the potential for crowdfunding. What this theory leaves out though is the importance of the small dollar donations from something other than money — a voice and a potential customer base. While 20% of a crowd might provide 80% of the financing, if it weren’t for the 80% who expressed interest in a company in the first place by pledging small dollar funds, those larger investors would not be stepping up to the plate with 80% of the financing. There is validity to the voice the 80% puts behind their dollars because it shows that there is interest from the crowd for the product. Market research like that prior to launching is invaluable and something any traditional financier would look for. We urge the Senate to enact the investment limits from our framework: $10,000/10% AGI (Whichever is lower). The Startup Exemption and the Small Business and Entrepreneurship Council had a briefing on December 13, 2011 at the law offices of Jones Day in Washington, DC to brief Senate Staffers and the Media on how Crowfunding currently work, how it will work under the law and answer questions. The following is a live Powerpoint Podcast of the presentation. Sherwood Neiss is speaking during this part of the briefing. He is one of the partners and Chief Advocates of the Startup Exemption, which is the group that brought the Crowdfund Investing framework to Washington which is the basis for all 3 bills in front of Congress.